Home » Hip Resurfacing Positive Info » What is Hip Resurfacing? Hip Resurfacing devices use a metal cap implanted over the femoral head and a metal cup placed in the acetabulum to provide a bearing surface. The use of this type of hip device results in a metal on metal bearing arrangement and is an excellent choice for hip replacement. The hip resurfacing procedure is bone sparing since it does not require the femur to be cut off. In a hip resurfacing operation, the surgeon removes only the diseased surface of the head of the femur. A spherical metal cap is fitted over the femoral head and the stem of the cap is normally secured with bone cement. The hip socket or acetabulum is lined with a thin spherical metal cup and it is not normally cemented. The Smith & Nephew Birmingham Hip Resurfacing Device (BHR) was FDA approved in the US in 2006. Other hip resurfacing devices are available overseas. A total hip replacement means that the top portion of your femur bone will be removed, the remaining bone will be drilled and a device with a long stem will be placed into the bone. The stem is secured with bone cement or secured with a press-fit depending on the technique chosen by the surgeon. A cup will be placed in the acetabulum of the hip to provide a pivoting surface for the ball of the femur device. If you ever need to have a revision, it is much more difficult to removed the stem from the bone after it has been in place for a number of years. The bone must be cut apart to removed the old stem. Revision surgery of a THR is again major surgery and often limits a person in their activities after the revision. There are many types of hip devices and they often dictate what activities are acceptable. The newer, large head Metal on Metal hip devices offer a person much more of a very active life style than the older, small metal and plastic hip devices. Hips for You is a website all about total hip replacement. There are two types of Hip Resurfacing: a partial (hemi) hip resurfacing or a complete hip resurfacing. The partial hip resurfacing results in a cap being implanted over the femoral head. No cup is placed in the acetabulum to provide a mating pivoting surface. The partial hip resurfacing results in a bone on metal situation. Partial hip resurfacing was the early accepted form of hip resurfacing in the US and was not always successful long term. The metal rubbing on the bone often failed over time. A partial hip resurfacing was used with patients who had osteonecrosis or AVN of the femoral head. 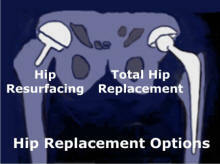 Partial hip resurfacing is not the best solution for hip replacement today. The Birmingham Hip Resurfacing Device by Smith & Nephew was approved by the FDA on May 9, 2006 and uses both a metal cap being implanted over the femoral head and a metal cup placed in the acetabulum to provide a bearing surface. The use of this type of hip device results in a metal on metal bearing arrangement and is an excellent choice for hip replacement. The new hip resurfacing procedure is bone sparing since it does not require the femur to be cut off. In a hip resurfacing operation, the surgeon removes only the diseased surface of the head of the femur. A spherical metal cap is fitted over the femoral head and the stem of the cap is normally secured with bone cement. The hip socket or acetabulum is lined with a thin spherical metal cup and it is not normally cemented.